Experience Berlin on the ‘bleeding edge’ during this 3-hour private tour of the city’s hip Kreuzberg neighborhood led by a historian guide. Immerse yourself in the creative mix of street art, local Turkish businesses, and trendy markets that have long attracted Berliners and celebrities like David Bowie alike. You’ll also get a sense for the area’s history and learn how Kreuzberg may change in the future. Choose either a morning or afternoon departure and meet up with your guide in Kreuzberg. 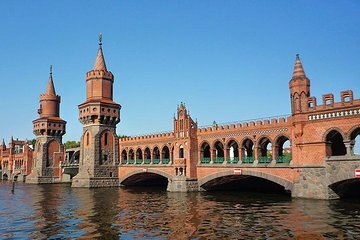 Make your first stop at the Oberbaumbruecke, a double-decker bridge which spans the Spree River. As you travel past the main landmarks of ‘SO36,’ the postal code and nickname for eastern section of Kreuzberg you’ll visit, listen as your guide explains the area’s rough-and-tumble past and its fast-changing future. Check out some lingering fragments of the Berlin Wall that once passed through the area, and discover how the area’s historic mix of abandoned buildings contributed to the vibrant street art culture and creative community that lives here today. You’ll also stop at Victoriapark, one of Kreuzberg’s best-known green spaces and visit the ‘Markthalle 9,’ a 120-year old market that today houses a range of trendy retailers and artisan vendors. Continue your walk by exploring Kreuzberg’s strong linkage to Germany’s Turkish community. Stroll past the neighborhood’s heady mix of flower-sellers, spice retailers and carry-out food shops. If you’re feeling hungry feel free to partake in delicacies like deep-friend cheese and spinach Gözleme, grab a falafel sandwich, or quench your thirst with some pomegranate juice (food at your own expense). Finish your walk by learning about the future plans for Kreuzberg, including the looming riverside development project which may soon speed up plans to further gentrify the neighborhood.